Black and white. 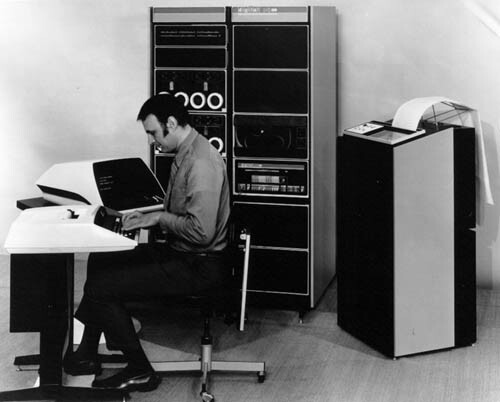 Man, sitting at keyboard, in front of a PDP-8-E. Printer is behind him. Image is grainy. Attachment (white single sheet of paper) reads: "3. Modern systems built around minicomputers can output reports in several ways -- in [s]ome cases, in more than one way simultaneously. Here, a minicomputer system is shown with an impact-writer terminal (a DEC-writer), a keyboard CRT display, and a high-speed line printer. Data could also be output as magnetic tape or punched paper tape in this system."